This article is about the 1986 comedy film. For the 1987 television show, see Gung Ho (TV series). For the 1943 film, see Gung Ho! (1943 film). Gung Ho is a 1986 American comedy film directed by Ron Howard and starring Michael Keaton and Gedde Watanabe. 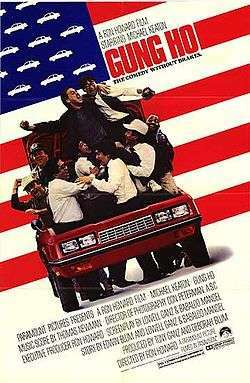 The story portrayed the takeover of an American car plant by a Japanese corporation (although the title is an Americanized Chinese expression, for "work" and "together"). The film was rated PG-13 in the US and certified 15 in the UK. Most of the movie was filmed on location in the Pittsburgh, Pennsylvania area with additional scenes shot in Tokyo and Argentina. The local auto plant in fictional Hadleyville, Pennsylvania, which supplied most of the town's jobs, has been closed for nine months. The former foreman Hunt Stevenson (Michael Keaton) goes to Tokyo to try to convince the Assan Motors Corporation to reopen the plant. The Japanese company agrees and, upon their arrival in the U.S., they take advantage of the desperate work force to institute many changes. The workers are not permitted a union, are paid lower wages, are moved around within the factory so that each worker learns every job, and are held to seemingly impossible standards of efficiency and quality. Adding to the strain in the relationship, the Americans find humor in the demand that they do calisthenics as a group each morning and that the Japanese executives eat their lunches with chopsticks and bathe together in the river near the factory. The workers also display a poor work ethic and lackadaisical attitude toward quality control. The Japanese executive in charge of the plant is Takahara Kazuhiro (Gedde Watanabe), who has been a failure in his career thus far because he is too lenient on his workers. When Hunt first meets Kazuhiro in Japan, Kazuhiro is being ridiculed by his peers and being required to wear ribbons of shame. He has been given one final chance to redeem himself by making the American plant a success. Intent on becoming the strict manager his superiors expect, he gives Hunt a large promotion on the condition that he work as a liaison between the Japanese management and the American workers, to smooth the transition and convince the workers to obey the new rules. More concerned with keeping his promotion than with the welfare of his fellow workers, Hunt does everything he can to trick the American workers into compliance, but the culture clash becomes too great and he begins to lose control of the men. In an attempt to solve the problem, Hunt makes a deal with Kazuhiro: if the plant can produce 15,000 cars in one month, thereby making it as productive as the best Japanese auto plant, then the workers will all be given raises and jobs will be created for the remaining unemployed workers in the town. However, if the workers fall even one car short, they will get nothing. When Hunt calls an assembly to tell the workers about the deal, they balk at the idea of making so many cars in so short a time. Under pressure from the crowd, Hunt lies and says that if they make 13,000, they will get a partial raise. After nearly a month of working long hours toward a goal of 13,000—despite Hunt's pleas for them to aim for the full 15,000—the truth is discovered and the workers strike. At the town's annual 4th of July picnic, Conrad Zwart, the mayor of Hadleyville (Rance Howard) addresses to the people that Assan Motors plans to abandon the factory again because of the strike, which would mean the end of the town. The mayor threatens to kill Hunt, but Willie (John Turturro), one of the workers, intervenes, insisting that it wasn't Hunt's fault for the closure. The mayor, even more furious with the townspeople taking Hunt's word over his, abandons the picnic. But by then Hunt comes clean with the 15,000 car deal. He also responds by addressing his observations that the real reason the workers are facing such difficulties is because the Japanese have the work ethic that too many Americans have abandoned. While his audience is not impressed, Hunt, hoping to save the town and atone for his deception, and Kazuhiro, desperate to show his worth to his superiors, go back into the factory the next day and begin to build cars by themselves. Inspired, the workers return and continue to work toward their goal and pursue it with the level of diligence the Japanese managers had encouraged. Just before the final inspection, Hunt and the workers line up a number of incomplete cars in hopes of fooling the executives. The ruse fails when the car that Hunt had supposedly bought for himself falls apart when he attempts to drive it away. The strict CEO (Satoshi Yamamura) is nonetheless impressed by the workers' performance and declares the goal met, calling them a "Good team." As the end credits roll, the workers and management have compromised, with the latter agreeing to partially ease up on their requirements and pay the employees better while the workers agree to be more cooperative, such as participating in the morning calisthenics. Both Bill Murray and Eddie Murphy turned down the role of Hunt Stevenson. Gung Ho received mixed to negative reviews, and has a 35% rating on Rotten Tomatoes. Toyota's executives in Japan have used Gung Ho as an example of how not to manage Americans. New United Motor Manufacturing, Inc. (NUMMI) was a joint project between General Motors and Toyota in Fremont, California from 1984-2010 which used what was "considered the worst workforce in the automobile industry in the United States", according to the United Auto Workers. Workers who made the transition identified the emphasis on quality and teamwork by Toyota management as what motivated a change in work ethic. Coincidentally, the fictitious "Assan Motors" name is actually used by a joint venture by Hyundai in Turkey called Hyundai Assan Otomotiv. The film spawned a short-lived TV series of the same name. Almost all of the Asian actors reprised their roles. Clint Howard was the only non-Asian actor from the film to appear in the TV show. The movie was released in Australia under the title Working Class Man, which was the title of one of the songs in the movie sung by Australian rocker Jimmy Barnes. The Fiat Regata (and Fiat Spazios) were used in various stages of completion. The factory shots took place in the Fiat plant in Córdoba, Argentina. 1 2 Canby, Vincent (March 14, 1986). "Gung Ho (1986) THE SCREEN: 'GUNG HO,' DIRECTED BY RON HOWARD". The New York Times. ↑ Gray, Beverly (2003). Ron Howard: From Mayberry to the Moon...and Beyond. Thomas Nelson Inc. ISBN 9781418530747. ↑ "Why Toyota Is Afraid Of Being Number One." Bloomberg Businessweek. March 5, 2007. Retrieved on July 9, 2011.